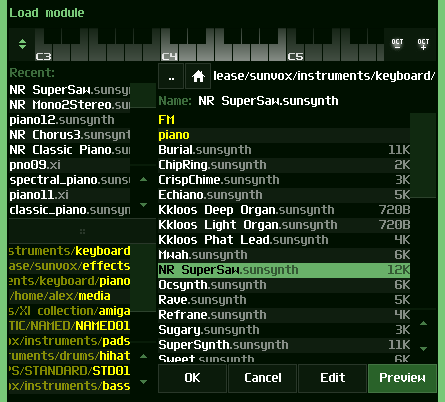 SunVox has been updated to v1.9.3! bug fixes: note hang in Glide, broken virtual MIDI IN port in iOS, problems with Wi-Fi Export/Import, etc. Nice update. I especially like the custom color themes. excellent,. . only now my game dev will take a huge hit as I use time to mess with all this new goodness. extra special thanks for releasing the library at the same time! I can immediately put to use in my newest game. Yeah, great work, Night! Super great to see more updates to this awesome piece of software! Hi. I have tested SunVox 1.9.3 on Raspberry Pi and it seems to be very slow. Previous version (1.9.2) was fine. Also I noticed that 1.9.3 requires SDL 2 (which was not installed on my RPi before), so I suspect that SDL2 is that slow thing. 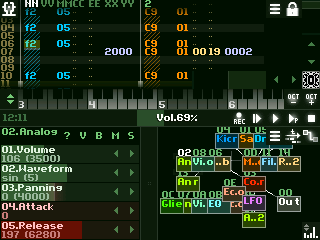 I'm loving the LFO updates. And I love the melodies in the sample effect envelopes example. I have also found some things to be maxxing out the cpu using 1.9.3, where previously I hadn't noticed it using 1.9.2. Unfortunately I can't A/B test my setup because I did a fresh install of stretch lite over my old microsd card, so can't be sure, but it definitely SEEMs to be running less efficiently, if that is worth anything. Nothing here to dispute your experiences, and I've no reason to think SDL2 definitely isn't to blame, but don't really know. 2) enable desktop OpenGL driver in the raspi-config. As far as I could understand, SDL2 is now optimized for OpenGL (even in 2D mode). So if you have no true OpenGL desktop driver enabled - SDL2-based apps may be slow. I got the best results (on my RPi 2 + latest Raspbian) with the "softrender" option and disabled OpenGL driver. Hey Nightradio! I am simply overwhelmed by how good of an update this is! the 07 command on the metamodule really changes everything now!!! you are one hell of a coder man! Definately I owe you a six pack or two!